Camiseta 2017/18 Real Madrid 2017-2018 Home. 2017-18 Real Madrid Long Sleeve Home Shirt - Kids (Ronaldo 9). 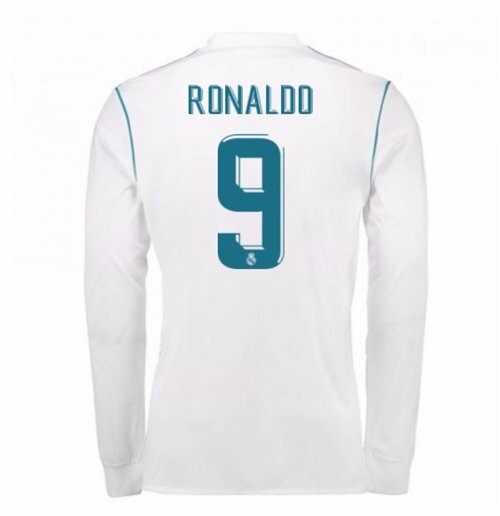 OfficialRonaldo football shirtfor the new Real Madrid football shirt. This is the new Real Madrid home shirt for the 2017-2018 La Liga season which is manufactured by Adidas and is available in adult sizes S, M, L, XL, XXL and kids sizes small boys, medium boys, large boys, XL boys.This Real Madrid football shirt is White in colour and comes withRonaldo shirt printingon the jersey.